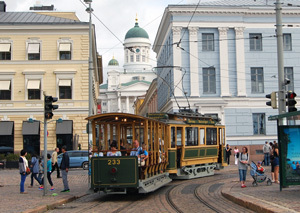 Stadin Ratikat Ltd organizes scheduled vintage tram traffic in the city centre of Helsinki! The trams leave from the tram stop at the Market Square next to the Havis Amanda statue. 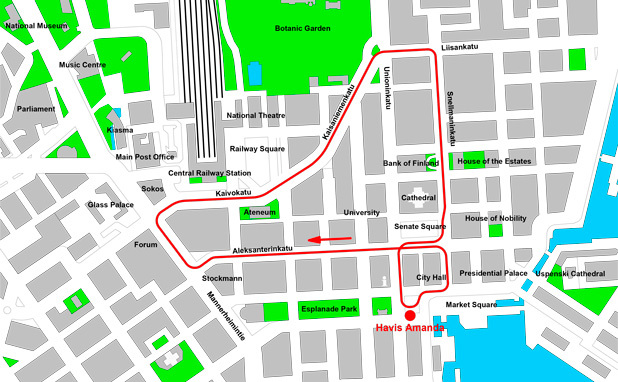 The map below shows the route. The schedule for the summer season 2019 will be published on this web page in April 2019. The first tram leaves at 10.00 am and the last one at 5.00 pm. There is traffic every 20–30 minutes. During bad weather the traffic may be cancelled. Tickets cost 6 euro for adults and children. Children aged 0–2 may travel for free sitting on a parent's lap. The motor car from 1909 is manufactured by ASEA, Sweden and the open trailer from 1919 by Hietalahti Shipyards, Finland. 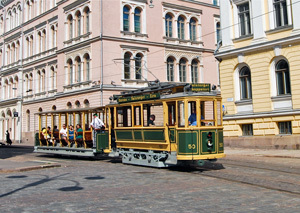 The motor car was used in daily traffic until 1956, the open trailer until the summer of 1952 when the Olympic Games took place in Helsinki.